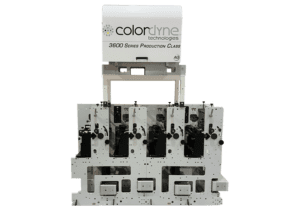 Colordyne’s 3600 Series AQ (aqueous dye) inkjet technology offers an affordable and responsive investment in digital printing. AQ printing platforms offer a cost-effective solution for short-run production and are designed to be upgraded as future product enhancements become available. Optimize your existing flexo press or web handling system with a digital enhancement. High speed, roll-to-roll digital label press with lower operating costs and greater flexibility. Why Choose Aqueous Dye Inkjet? 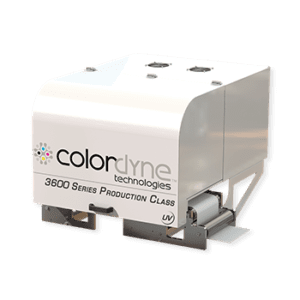 Water-based dye inkjet solutions from Colordyne offer a low capital cost investment for converters and print providers looking to add digital production to their business for the first time. 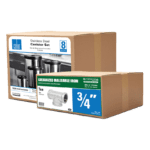 Reduce setup and changeover times by printing short run and high-mix, low-volume jobs digitally. Seamlessly add variable data to jobs at any production length. Plus, the press is easy to use and self-maintainable, increasing productivity and reducing downtime. 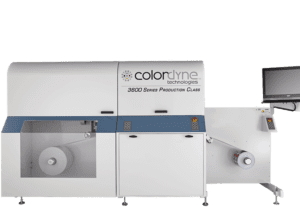 Colordyne’s aqueous dye solutions provide industry-leading print speeds and resolution for label and packaging production. 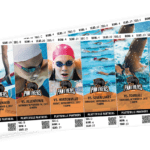 Produce labels at 1600 x 1375 dpi while running 275 ft/min (84 m/min), or run in enhanced efficiency mode at 1600 x 1135 dpi with speeds of 335 ft/min (102 m/min) to meet tight production deadlines. Need an Aqueous Pigment or UV Inkjet Solution? 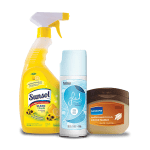 Looking for a solution for a wide range of applications, including durable and industrial labels? 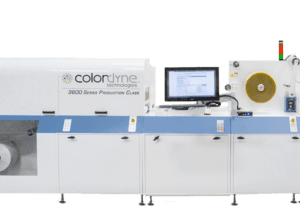 Colordyne’s UV solutions give you a broad approach.